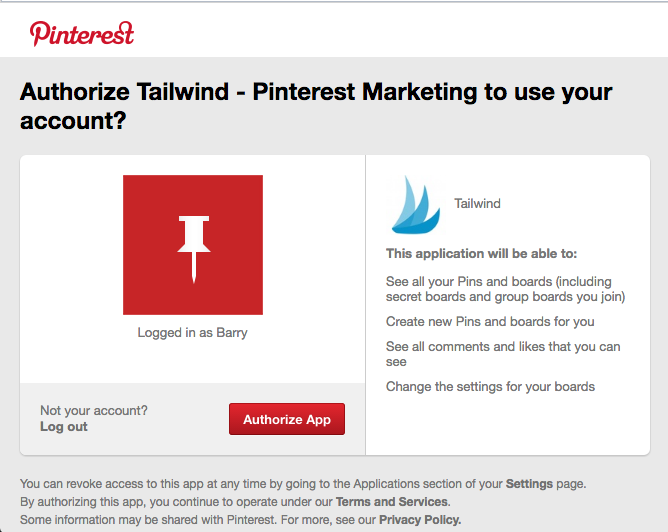 To create an account, does Tailwind need my Pinterest login information? Nope! Tailwind will never ask for your Pinterest login information. We authenticate (or access) information about your account directly from Pinterest. This helps keep your account safe and secure, and ensures your account will never be edited or updated without your permission. You should never use any tool that ask for your Pinterest username and password. Why? Tools that store your username and password are likely to have little to no security standards in place. By giving such a developer your information you are making your Pinterest profile, personal information, credit card data (via Buyable or Promoted Pins) and other information easier for hackers to access. If you use the same password for other websites as well, this could be a big problem! Tools that ask for your username and password are breaking Pinterest's rules. If they're willing to break the rules, you probably should not trust that they won't do other nefarious things like post to your account without permission, distribute spam/malware, or sell your email or other data. To be safe, always stick with an approved Pinterest Marketing Developer Partner. Even if you don't choose Tailwind (we are a Partner), we'll sleep better at night knowing you went with another approved partner.